The series is open to all researchers (PhD students, post-docs, visiting staff, permanent staff) at Lund University and aims to be a learning platform about accessible in-house infrastructure resources such as labs, facilities and expertise. Researchers from all faculties and centers are welcome to join! 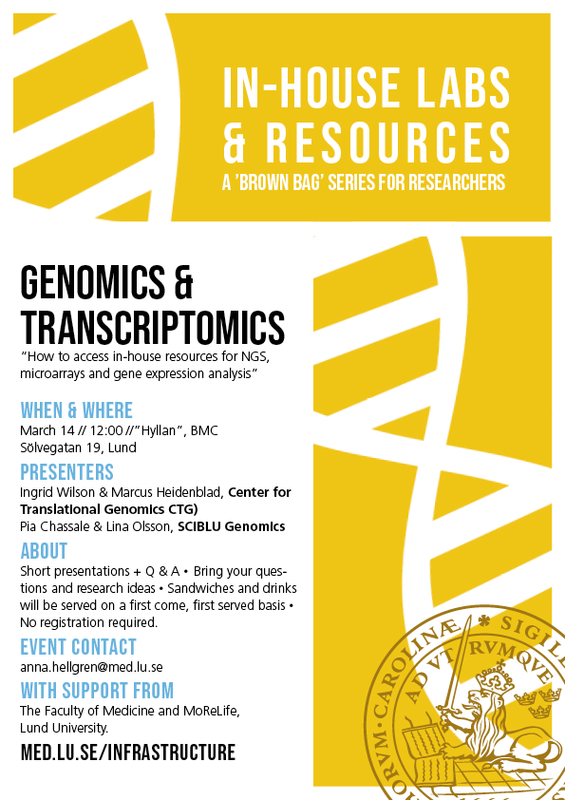 Presentations by Ingrid Wilson & Marcus Heidenblad, Center for Translational Genomics (CTG) Pia Chassale & Lina Olsson, SCIBLU Genomics. SCIBLU genomics offers a variety of technologies for gene expression analysis, from complete Transcriptomics microarrays, to targeted analysis of specific biological pathways using Nanostring. Short presentations + Q & A • Bring your questions and research ideas • Sandwiches and drinks will be served on a first come, first served basis • No registration required. Single particle cryo-electron microscopy − a technique in medical research that is here to stay! Curious about the Nature Method of the year 2015, the technique behind the Nobel Price in Chemistry 2017 and the method that triggered an on-going revolution in how to understand molecular structures such as proteins, protein complexes, and protein-ribonucleic acid associations with potential for wide scale pharmaceutical solutions for treating diseases and disorders? 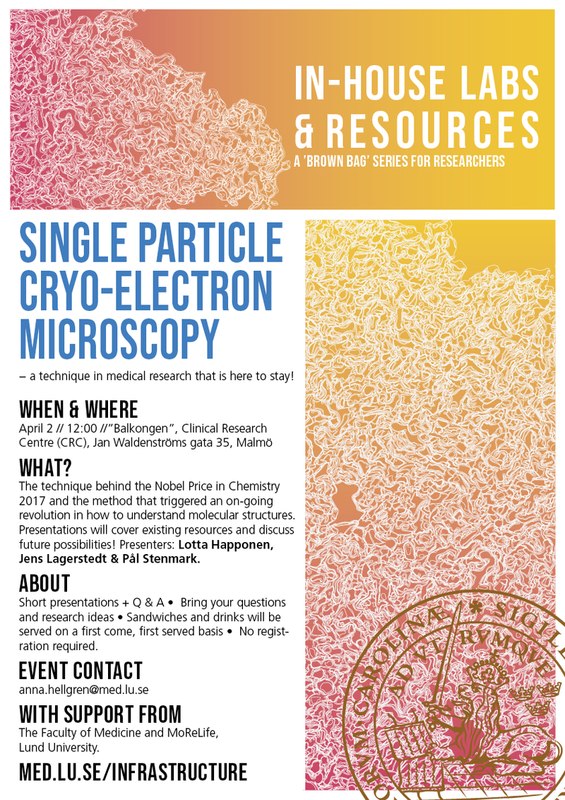 Join us at CRC the 2nd of April to learn more about the potential of the method and about the opportunities for single-particle cryo-electron microscopy at Lund University and SciLifeLab! Presenters: Presenters: Lotta Happonen, Jens Lagerstedt, Karin Lindkvist & Pål Stenmark. Computational resources for life sciences at LUNARC provide tools, workflows, and liberate researchers from doing system administration to do research instead. LUNARC and hosted infrastructures provides easy access to your large datasets, enables faster analysis, and provides supported software for e.g. bioinformatics, structural biology and image analysis. Presenters Anders Sjöström, LUNARC, Shamit Soneji, Sonja Aits and Lotta Happonen.